Normally when the clocks go forward I find it hard to sleep the following evening – especially as it is a Sunday, which usually follows two days of late evenings staying up and long mornings spent in bed. Although despite my body clock thinking it’s not even 9pm (like the display on the cooker which needs to be manually changed), I am absolutely exhausted. I think this could be due to the fact I went to Cumbria and back yesterday, getting up at 6am and not returning home until almost 18 hours later. It was a long day. Anyway, I’m off to bed now. Back to work tomorrow after a few days off. Luckily I’ve taught my iPhone alarm to work properly, so I get in on time. I will neither be supporting nor watching the England national football team tomorrow. One reason for this is I am going to Barrow in Cumbria to watch Bath City (just a short 550 mile round trip). Even if I was staying at home, I wouldn’t care less about the game. Over the years, my feelings for the England team have changed from pride and patriotism to one of annoyance and disrespect. This was heightened during last summer’s World Cup, where it was the “last chance saloon” for the players – impress me or say goodbye. We all know what happened. I’m not saying I want England to lose to Wales. I simply don’t care about the national team anymore. Although if the self proclaimed “world beaters” did fail to beat the “3rd world county” by 6-goals to noting, or even lost the game, I would raise a wry smile at the inevitable media explosion as World War 3 kicks off; with Cockneys, Geordies and Scousers all calling England’s representative from Northern Ireland, Alan Green, to express their anger. I can see it now… “I have never been this angry in all my life” Dave from Sunderland would rage, before adding “No team has ever showed such a passionless display”. Dave clearly forgetting all the 2010 World Cup games and 99.9% of any international friendly played in the last 15 years. One of the reason why I find it so hard to give a damn about England is that the players clearly don’t give a damn themselves. They, like a lot of the fans, see the international break as an annoyance. And can you blame them? If I was paid in excess of £100,000 a week, under the condition my fitness was perfect, I wouldn’t want to play additional games and risk a career threatening injury either. The game has been poisoned by money. 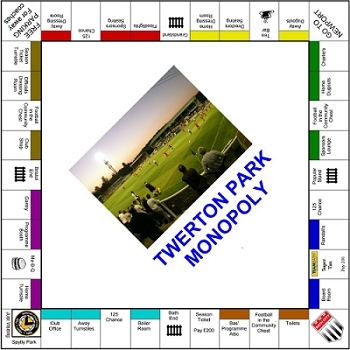 This is one of the reasons I have fallen in love with non-league. Yes the players get a modest wage, but it isn’t stupid money and insignificant to what the likes of John Terry and Wayne Rooney command. Regardless of income, most players at non-league level play with pride and passion. I would much rather see an England team of players show that they want to play for their country and not their bank balance end up losing 4-0, than a bunch of overpaid, overrated morons win 1-0 (or lose 4-1, if playing Germany). This isn’t to say that I’ll never support England again, but wholesale changes need to be made from many levels including the board, management and players. Those arrogant fans who think England are the best in the world need a reality check too. Until that comes, I simply don’t care. 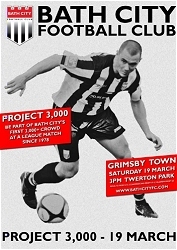 Last season, Bath City famously beat Grimsby Town in the FA Cup. A lot has changed since then – we’re now in the same division and met for the first time in the league yesterday afternoon. I am sure a lot of people were anticipating a revenge mission from Grimsby. Grimsby had all the revenge of the shark in Jaws: The Revenge. A bit of bite, a fat person got eaten, but in the end simply got spiked to death in a humiliating fashion by Michael Caine. In other words, Bath City won 2-1. The game probably made more news due to a promotion, with an aim to attract 3,000 fans, offering anyone who can prove that they are of Polish origin a large discount upon entry. If nothing else, it gave The Daily Mail an excuse to stir up some racial hatred. Incidentally, I don’t know how many Poles actually turned up to the match. According to the fascist newspaper, unless you are a born and bred British Bulldog, you walk around with devil horns. As I saw nobody at Twerton Park with horns coming out of their skull, either no Polish people turned up, or The Daily mail have got their description of “Johnny Foreigner” wrong. I would make another ‘Downfall’ video about the event, but considering it involves Adolf Hitler, I think it would be very inappropriate. John introduced Simon and I to a new US comedy at the weekend – Outsourced. The sitcom basically follows a team manager who is sent from his American office to one in India – with predictable culture conflicts between Indians and Americans. It is funny and inoffensive. I don’t think it has been shown on UK television yet, although after reading my raving recommendations, I am sure Rupert Murdoch will immediately commission it for Sky One. If you cannot wait for it to hit our side of the pond, I am sure you can find it on some torrent site or something dodgy like that. For the record, John recently made a trip to New York where he recorded all the episodes onto Betamax video tapes, therefore making our viewing of the series a little less illegal than if we were to have downloaded it from the internet. Since I last blogged I have become a gambling addict. A large sum of my hard earned money was bet on a huge football accumulator which would have seen me win almost one million pounds. Unfortunately, my bet failed and I have lost my money. I am broken and in a state of despair. Still, I am sure I can win my money back next week and will try again. I am sure I can borrow or steal another ten pence piece to place a similar bet next week. I’m not generally a fan of rap music. I don’t enjoy the aggressive lyrics and violent nature which the artists portray. However, I was saddened this morning to learn of the death of Nate Dogg. He was one of the few hip hop artists I actually enjoyed listening to. His deep tones, often collaborating with other artists, were a joy on the ear. Although I do not always like to content of his lyrics, which like fellow rap artists, reference murder and gang life, Nate Dogg always performed them in a way which musically I could not help but admire. Personally, I cannot see how the likes of Eminem, who ‘whinge raps’ about brutally murdering his ex-wife, can be so highly rated while Nate Dogg’s talent went generally unnoticed in comparison. I’ll leave you with one of favourite Nate Dogg records – Warren G’s Regulate.